Weld Wizard is a high quality abrasive suspension formulated for the removal of weld discoloration and other scale from stainless steel and other metals. Contains 1 quart (32oz) of Weld Wizard liquid. One ounce covers approximately 24 feet of weld. 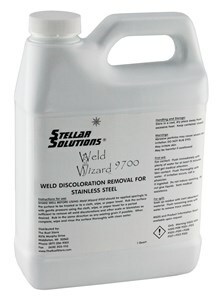 Weld Wizard 9700 is for manual removal of weld discoloration. For Electro-Chemical weld cleaning, use Weld Wizard 9003. For best results, clean treated area thoroughly to remove dirt, oil and grease. If cleaning isn't possible, wipe area clean. Apply Weld Wizard sparingly to surface with a cloth or towel. Rub the surface with gentle pressure using cloth or towel until discoloration is gone. Wipe and rinse thoroughly with clean water. Dry completely by air drying or using hot air (i.e. hair dryer). If passivation is required you may passivate the surface with one of the Citrisurf® products.